Canada is a huge country and it is vast and beautiful. Seeing it all and doing it properly could take a year or more, and not many people have that kind of time. However, by focusing on one province a trip becomes more manageable and more affordable, when it comes to time and money. 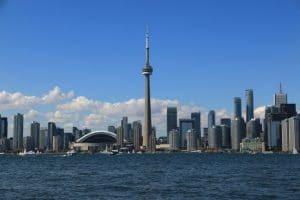 Of course Niagara Falls is one of Ontario’s treasures, but if you’d like to explore more of the province’s sites after your visit to Niagara Falls these are just a few of the reasons to love Ontario and some of the incredible activities you can take part in. Ontario’s capital city is one of the most diverse cities in the world and is only a few hours’ drive from Niagara. Here you’ll find world-class dining, museums, gorgeous parks, and a booming nightlife. The Lake Ontario Harbourfront is a great place to grab a meal or a beer with a gorgeous view. However, the highlight of the city is the famous CN Tower. Topping out at just over 1,800 feet the sweeping view of the city also includes the airport, where you can watch the planes take off and land. Ontario is almost completely surrounded by water which makes for stunning scenery and endless road trip options. The Trans Canada 17 highway will take you through the forests surrounding the lake and the lakeshore itself, all the way to Thunder Bay. Quaint shops and inns dot the way so you can take as much or as little time exploring this part of Ontario as you’d like, but we recommend taking your time for this beautiful part of Canada. Within an hour of both Niagara and Toronto is the unassuming town of Stratford. However, it’s only unassuming until you realize the significance of this little town of 30,000 people. Home of the largest repertory theatre in North America, the Stratford Festival runs each year from April to October. While the theatre primarily focuses on the works of Shakespeare they include performances from other well-known playwrights too. Check out this year’s schedule and take in an incredible performance while you’re in Ontario. 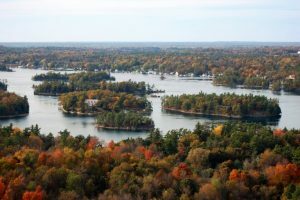 Located in the St. Lawrence River and numbering closer to 1,800, the Thousand Islands are another perfect way to experience Ontario’s gorgeous scenery. You can choose to kayak or canoe your way through the islands or hire a guide for a more thorough understanding of the area. Since the St. Lawrence River makes up part of the border between the United States and Canada, be sure to carry your passport at all times. Cottage country is not one single place but rather any place where lakeside cottages exist, and in Canada that could be anywhere. However, Georgian Bay is Ontario’s most popular cottage country and when summer hits, the area is booming. You can visit for a day and experience the laid back feel but why not rent a cottage for a night or two? Then you’ll really see why cottage season is so popular. A visit to Niagara Falls is just one way to experience Ontario. Consider extending your trip and see some of the other things this area has to offer.